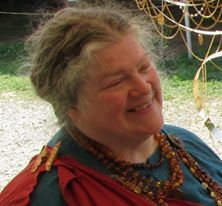 Listen to Tchipakkan on the New Normal Wednesday night (November 30th) from 8 to 9 pm edt. as she talks about Ghost Armies. From earliest times, there have been reports of groups of specteral entities, often in the sky, often dangerous to encounter, although not always, commonly called the Wild Hunt, and associated with the dark time of the year. These reports have continued in every period, up to the modern song Ghostriders in the Sky. One might even include Santa Claus as a part of this tradition, especially when some of the earliest versions were also bringers of gifts and blessings. If you miss the show, we’ll post the link to the archive here for you to listen later. 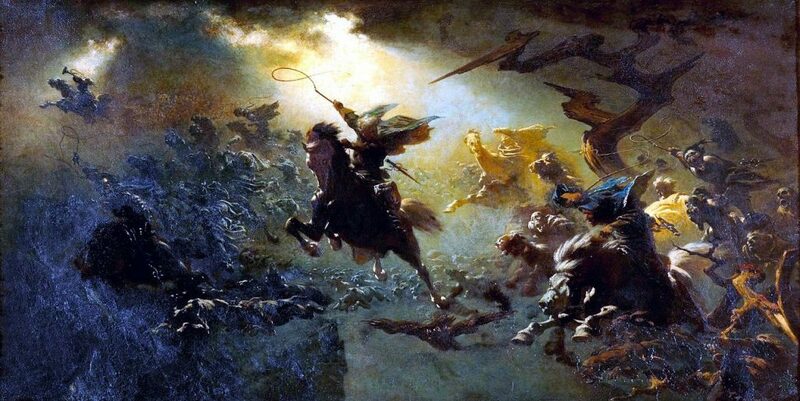 The Wild (or Infernal) Hunt, Herlaþing, Hounds of Annwn, Wilde Jagd, Noisy Riders, in folklore are tales of an army of spirits who could be heard passing on winter nights, and if directly encountered was dangerous to body and soul. From souls of sinners or unbaptized babes to pagan gods, these were objects of horror, pity and danger, or at least contact with the divine. I’ll try to cover as many versions as I can, from the Benadanti through the cursed huntsmen, to the Krampus connection. This entry was posted in Tuesdays New Normal announcements and tagged Abundia, Cursed huntsman, good women of the night, Holle, Mesnie Hellequin, Odin, Perambulating purgatory, Percht, Santa, wild hunt. Almost all pantheons have divinities or supernatural beings who may be regarded as on the dark side and who primarily deal with sickness and death. 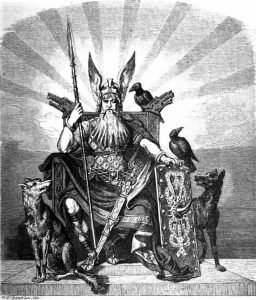 In the North, we have Odin and the valkyries, as well as some of the elves, vettir, and the Underjordiske (Under-Earth Ones). Heading south, there are Charun, Pluto, Apollo, various demons, Set, and more. Christianity has Satan/Lucifer and a legion of various devils; Islam has Shaitan and Iblis. Judaism seems to have demons (lower case d) floating around, but no major Dark gods or goddesses. Tibet, China, Japan, India, and Africa have Dark Ones, as do the cultures in the New World. In this panel, we shall explore the nature of these Dark Ones, contrasting and comparing their attributes. This entry was posted in Fridays Panels and tagged Charun, dark, gods, Lucifer, Odin, panel, Pluto, Set.